The whole point of coming up with the VERT Wearable Jump Rate Monitor is to deliver better experiences in the athletic arena, where this particular device prides itself in being the first sports wearable in the market that is capable of measuring jump rate. 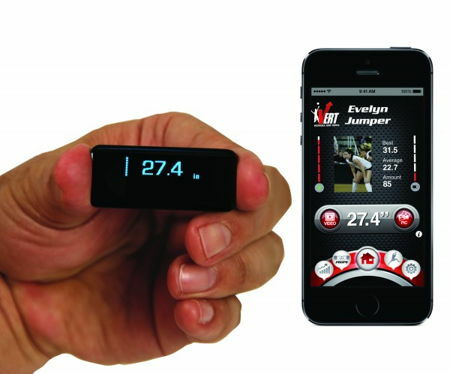 The VERT Jump Rate Monitor happens to be a non-invasive, miniature inertial measurement unit (IMU), where it will enable athletes to perform in games and practices without experiencing any kind of discomfort – internal or external. How does it work? Well, it will play nice with an iOS app for instance, where it can be monitored by coaches during the duration of its use, and instantly provide jump rate, jump height and any additional jump-related measurements. Not only that, users will also be able to check out and keep track of VERT Jump data on compatible smartwatches for a quick and easy review. The asking price for the VERT Jump stands at $124.99 a pop – not too expensive, but then again, it is not something that you would pick up as an impulse purchase. For those who constantly want to improve themselves in whatever sport that they are engaged in, intensifying one’s training on a year-round basis, the VERT Jump would help one enjoy safe practice sessions without compromising on the quality. After all, sports that require explosive jumping movements including the likes of volleyball, basketball and track and field would need a device that is able to monitor the frequency or intensity of those jumps, all the while helping ensure that safe injury preventive practice habits are in place. This is a brand new fitness measurement in its class, where VERT units are capable of calculating motion in all directions, thanks to a proprietary algorithm which holds over 53 simulations to measure vertical height. For those who train simply to stay in shape or compete in individual sports, VERT can also be used to measure jumps whenever you are involved in a jump rope workout or cross fit routine. There is a little something for everyone after all this Christmas.